An authentic sweet chilli sauce made with big chunks of garlic and chilli that will enhance your Thai dishes. Perfect for dipping fried foods, or for twist on coating chicken wings. 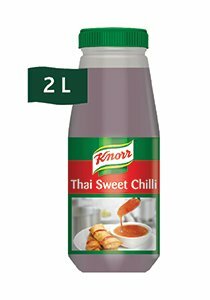 • Knorr Sweet Chili can also glaze and marinade meats and vegetables.